A best-selling writer moves his family to a picturesque small town after tragedy strikes. 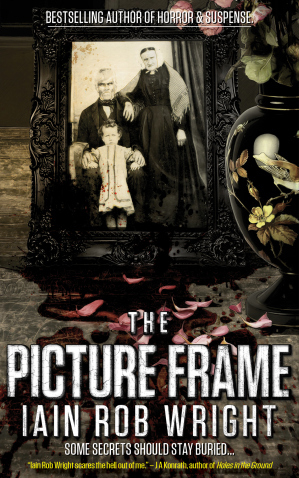 Things go fairly smoothly – with the promise of a few titillating blips – until his son digs up an old picture frame on their property. They bring it into their home and its malevolent power begins to infest their lives. Honestly, I was kind of sold from the start because I have always been a fan of ‘object’ horror pieces – haunted mirror, doll; you name it so I had high hopes and was not disappointed. The writing was fast paced and engaging and the characters and their personal conflicts were quite believable and relatable. The characters of Stevie and Thatcher stuck out as two of the best and the conflict between the two brothers tugged on the heartstrings. All in all, the family is sympathetic enough for you to root for them in the face of their tragedies and the importance of that in a horror novel cannot be overstated. The style of the novel was very modern thriller but the introduction of the town’s past into the mix gave it a gothic feel which jarred with the overall setting but in a good way rather reminiscent of Edward Lee’s ‘The Black Train’. Being introduced to a nice small town and then finding out that it’s not nearly as nice as we thought is another of my favorite horror setups. My only criticisms are that I wanted Thatcher’s character fleshed out a bit more and I really, really wanted to know more about the town’s history. Wright dripped too many hints with no follow through. I forgive him this, however, in the hopes that the sequel he strongly hinted at will happen. Overall a good, fast read and highly recommended. Four out of five stars.